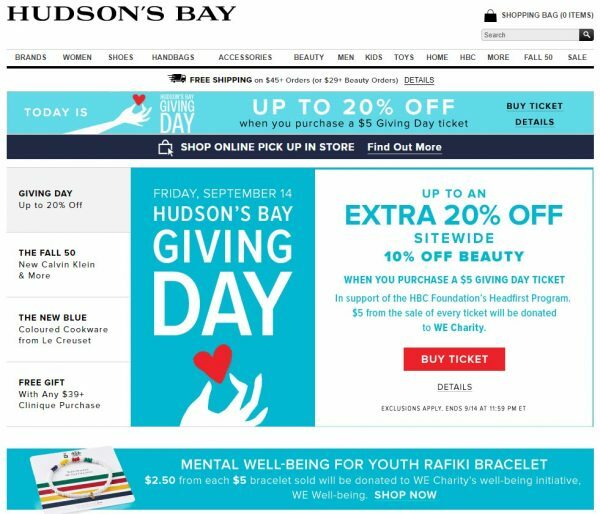 Today (Friday, September 14, 2018) is Hudson’s Bay Giving Day. $5 from the sale of every Giving Day ticket will be donated to WE Charity in support of the WE Well-being program, providing students and educators across Canada with resources and tools to nurture their positive mental well-being. The sale is available in-stores and online for 1-day only today (Friday, September 14, 2018). Extra 10% off cosmetics, fragrances and select home items no matter how you payExclusions apply. To redeem the above savings, purchase a $5 giving day ticket. Ticket must be in your cart at time of checkout. Offer valid only in a transaction with ticket purchase. Each new transaction requires new ticket purchase.